Make the most of your vertical space with the Shaina Bathroom Linen Storage Cabinet from Wyndham Collection, a perfect way to dramatically increase your storage space without paying for costly built-ins. A soft-close door and drawers ensure peace and quiet in your bathroom oasis, while the brushed nickel hardware accents complete the look and complement any modern bathroom setting. Finished in rich espresso, this freestanding design offers a small footprint and is easy to place wherever it is most convenient. Shaina 24-inch W x 71-inch H x 17-inch D Bathroom Linen Storage Cabinet in Espresso Make the most of your vertical space with the Shaina Bathroom Linen Storage Cabinet from Wyndham Collection, a perfect way to dramatically increase your storage space without paying for costly built-ins. A soft-close door and drawers ensure peace and quiet in your bathroom oasis, while the brushed nickel hardware accents complete the look and complement any modern bathroom setting. Finished in rich espresso, this freestanding design offers a small footprint and is easy to place wherever it is most convenient. 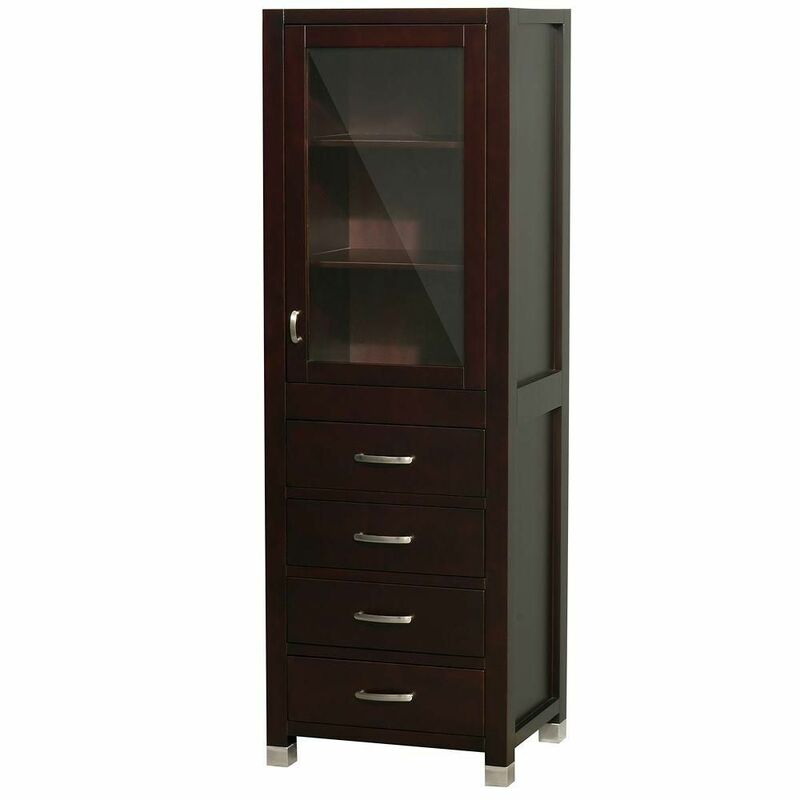 Shaina 24-inch W x 71-inch H x 17-inch D Bathroom Linen Storage Cabinet in Espresso is rated 4.5 out of 5 by 2. Rated 4 out of 5 by robsecure53 from Good Quality Product Good Quality Product, but you have to drill holes and mount the handles yourself. Would be nice to know this in advance. Shipping was fast, but the carton arrived damaged.